Click here to see the full-size ax-pain. Sometimes you can only take it out on yourself. BALLPOINT ADVENTURES for 5/25/15: Billy and Barbie are Celebrating Memorial Day in Their Own Way! I try to tell this joke every year around this time. Click here to see the full-size neck-pain. Ask a stupid question, get decapitated. That's how it works. Click here to see the full-size A-hole. I think Billy might have more to say on the idea of Republicans running for President soon. Click to see the full-size embarrassment of all men--I MEAN--the full-size image. Guys, let this be a lesson to you. Never let your lady own an ax. Or, you know, actually call her afterwards. BALLPOINT ADVENTURES for 5/11/15: Billy Wants Barbie to Sign Something--it's probably really bad, right? Click here to laugh even harder--I MEAN--see the full-size comic. On a complete side note, see the sidebar on this website? 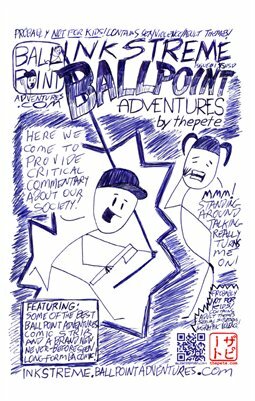 Look in the fourth box down--enter your email address in there and you will get the latest Ballpoint Adventures comic posted on this blog in your inbox!! Pretty cool, huh? Go do it! Thanks! Click here to see the full-size self-loathing--I MEAN--the full-size comic. Sometimes, we are our own worst enemy. BALLPOINT ADVENTURES for May 4, 2015: Billy Wants You to Trust His Sources! Click to see the irony--I MEAN--the comic at full-size. The next time someone tells you to trust them without proof or even evidence, please remember this comic. This was drawn for May 4, but didn't get it uploaded until May 11. For the sake of keeping the post dates on BallpointAdventures.com consistent, I've post-dated this strip for the day it should have been posted. Sorry for any inconvenience--had family in town that week and came down with a bit of a cold and I was a little distracted on the 4th.